Have you ever sat and wondered what on earth God was doing in your life? Wondered where this part of it would end? When would it end? Cry a bit over the uncertainty? Scream a bit? Just because you didn’t like the road you were on. That has been the last ten months for me. Can you believe it was ten months ago that Mark got the job with GM at Austin and we needed to move west a few hours? We both thought it would be easy enough as other changes in our lives had gone easy for us. Easy trust. Easy belief. Then came this one. Mark was wanting to leave HP. They just helped him and a whole lot of people out of the door. It was only a month. He had the interview he felt good about. Didn’t hear back. Why God? Then when he contacted them, “Oh, you should have heard two weeks ago.” Yes, we want you.” TWO WEEKS AGO! Lord why the wait? Then came the need to sell a house. We didn’t get to pick who we worked with as Relocation took care of that .. and no we didn’t like the way it went but finally it pleased the realtor to put the house on the market. Ready for this? The week after school started. The end of the best season to sell a house. It was a long patience game but finally we closed December 5th. Now we could all live together in Austin without Mark traveling back and forth on weekends. Our first week was in a very low end motel that would allow two dogs. I wasn’t looking forward to this step but once there, we made it work. Then our realtor in Austin (a gal we love) found a condo for rent for us. I was unsure. You know that unknown out there that Hamlet talks of so well. His a different situation. But the sentiment was the same for me. ‘An undiscovered country, that makes us rather bear those ills we have than fly to others that we know not of?’ With two dogs I was so unsure of a condo. But God’s care was evident immediately when we went out there. It worked. We filled out parking passes for the end January and said this will work for two months. Sam watching deer with the dry lake bed behind the island. Docks high and dry. Oh, how little we knew! Two months! What we thought and what God thought was necessary was so different – Once again. We looked at so many places. Put in four offers over time. Alas and alack still no place to call our own. I was so frustrated. Why God? Why closed doors? Why this life? I don’t like it! Mark sent me a home to check out. It was farther out than any I would have picked. It was a bit more expensive than Mark wanted to pay. It was within what we could afford. It looked perfect. It came on the market the day before. We went to look. Now you want to see an excited realtor? Paulette just laughed at me running around the house. Then she reminded me of my one prerequisite for a home. The dining room must fit our set from Belgium. Guess what? No, this place didn’t fit that criteria. But it didn’t matter to me. We could make it work. So after a lot of tension for Mark and frustration in closing on a place in our present world we finally had a home. We got to move in a week ago today. With our things delivered the day after. So did God have a plan for us? You bet! You know how Romans 8:28 gets so over-used and miss-used? Well, it is still the verse for God’s people to hang onto in the rough patches. You see He did have a reason and plan for our lives. Nothing happens without a purpose. All things do work together for good. It was amazing to live on Lake Travis for 5 and half months and watch the lake come up. Little did I know that when I took that first picture that first day, I would end up with a photo documentary of the rise of the lake after years of drought. We were on an island that hadn’t been an island for a long time. When we checked out. There was water all the way around it once again. With the flooding happening all around us in Texas this spring, we were high and dry and out of the way. Our old home had massive rains. Austin had massive rains. Flooding all over. We were dry. Living in the big city what is the native fauna? Well, squirrels, more squirrels, oh and squirrels. Ok, also some vultures. Great to clean up roadkill as no one else did. 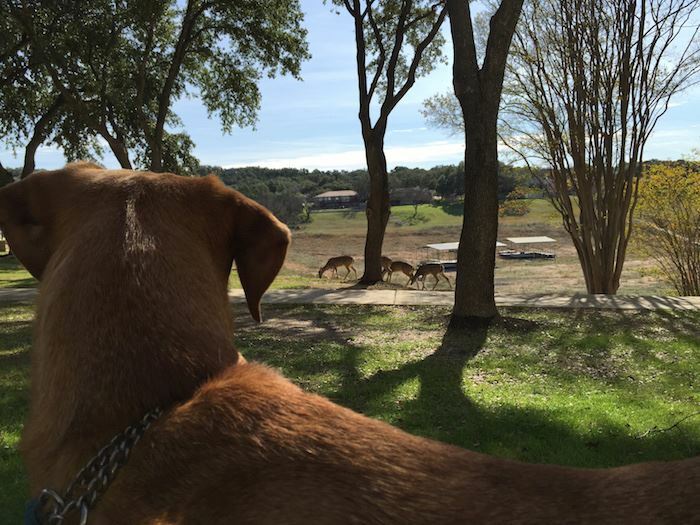 Now we were relatively in the country and did I ever enjoy the deer at the condo. So many. So interesting. We were even there long enough to see the babies. Time that we didn’t want to take but was worth it. And then birds! There was a menagerie of different birds to listen to and watch. 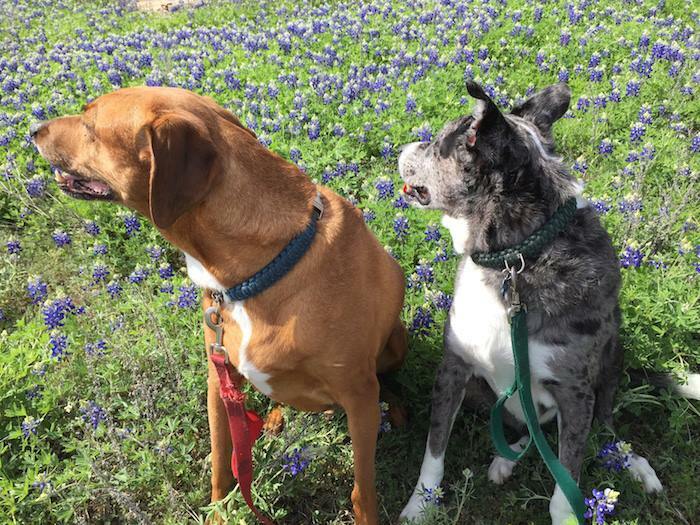 Sam and Mattie watching birds instead of caring about pictures in bluebonnets. What about wildflowers? Texas is famous for a love of wildflowers and for the first time in my almost 12 years here, I was privileged to have them all about and see their progression from Bluebonnets through countless others growing along the dry lake bed. Amazing to watch the Lord’s nature at work on every walk we took. Was this long journey worth it? When I asked Mark that question, I was excited to hear his answer was unequivocally the same as mine. This place was worth the wait. All the frustration. The questions. The uncertainty. The lack of faith that should never have risen in the first place. God had a plan and it just took longer than we wanted to work it all out.